Hello and welcome to my blog. 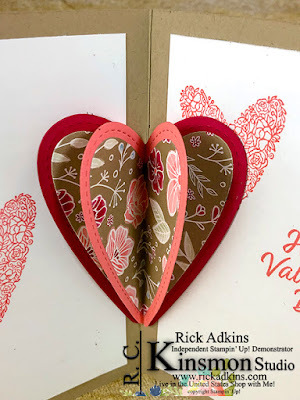 Today, I am going to share with you a card that features products from the All My Love Suite from the 2019 Stampin' Up! Occasions Catalog. With Valentine's Day right around the corner now's the perfect time to make those last minute cards for your loved ones. And, why not make it a card that's very special. My card today is one of those type cards. It has a special feature that shows that special person just how much you really care. This simple looking card on the outside has a little special love on the inside. I know that you are wondering what the inside looks like so I am going to share it with you now. This card looks a lot harder than it really is, and if you have followed my blog you know that's how I roll. I love cards and projects that look complicated but are quite easy. I started out with a piece of Crumb Cake cardstock (5 1/2 x 8 1/2 scored at 4 1/4) as my card base. I actually started this card on the inside instead of working on the outside design first. 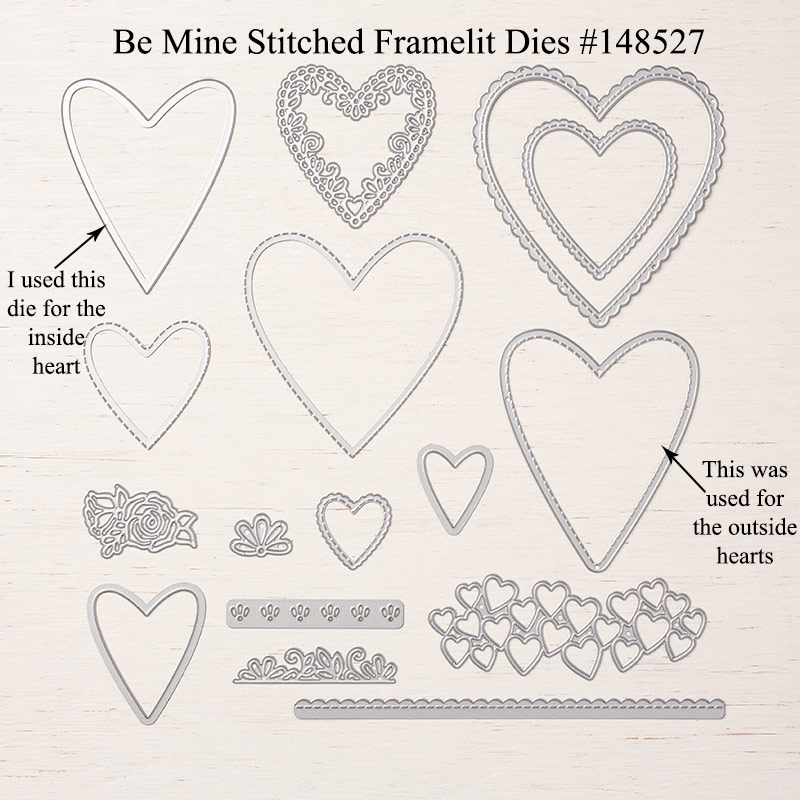 I used the Be Mine Stitched Framelit dies to cut out a stitched edged heart in Lovely Lipstick and Flirty Flamingo cardstock. 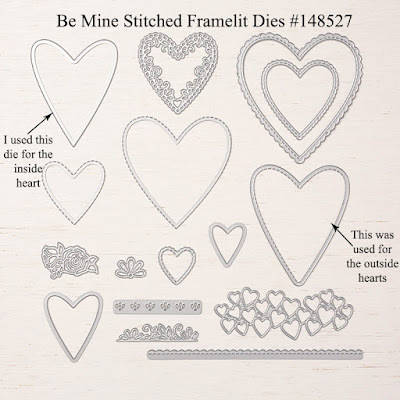 I used the second die marked in the pictured to cut out the smaller heart from the All My Love Designer Series Paper. I cut 3 hearts to use. 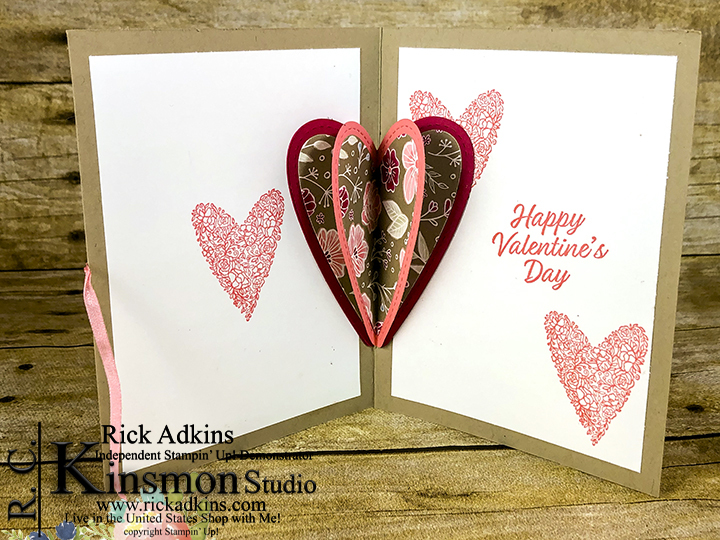 I cut the Lovely Lipstick heart in half and then scored the flirty flamingo cardstock heart and the designer series paper hearts in half. I folded and burnished the hearts on the score lines. 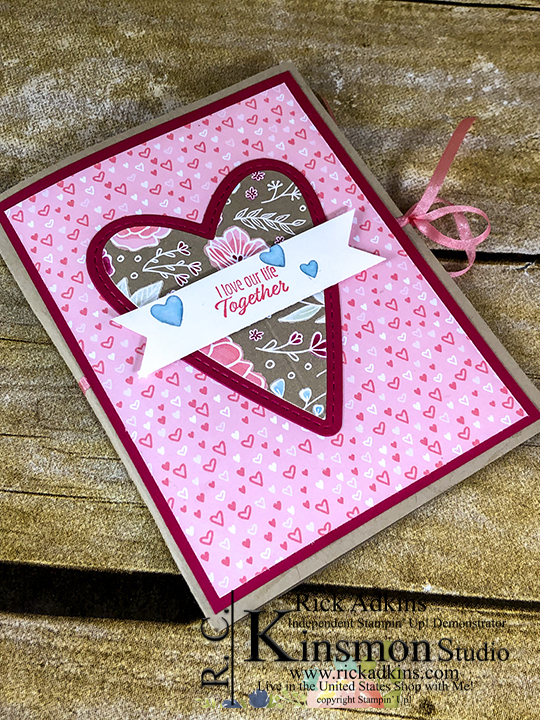 I then took the designer series paper hearts and glued them to the cardstock hearts. At this point it was time to put the outside heart pieces together. I took the center hearts and glued one side to half of the lovely lipstick heart. Then I glued the other side to the other piece the lovely lipstick heart. Once they were all together I set them aside to dry.